Mark Dorsey and Leslie Ruckman earned the yellow headband for being points leader and highest winning average, respectively. Paul Skuta wins the night’s one-handed side event against Leslie on Wipe Out to win a Blade Runner poster. There’s still three weeks left of the PPM League Season 2. It only takes making three nights so you can still qualify for the Finals. 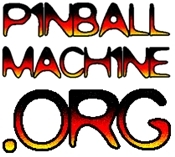 Wednesdays at 7 PM at the Pacific Pinball Museum.